This starter flock is what we would consider a great producing flock and a start for a future 4-H/ FFA showmen! *NOTICE - THE PICTURES ABOVE INCLUDED WITH THIS AUCTION ITEM OF THE STARTER FLOCK ARE NOT OF THE ACTUAL SHEEP THAT WILL BE INCLUDED IN THE STARTER FLOCK. 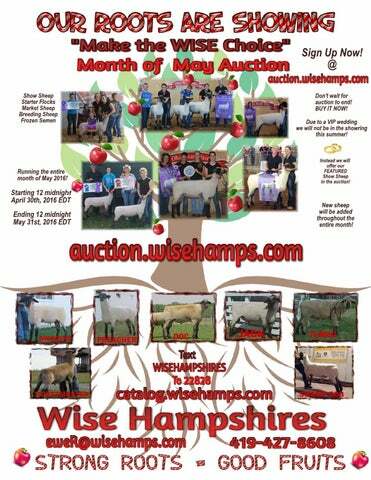 Although we will not have individual pictures, we will offer the winner of this auction their choice of a yearling ram or ram lamb. 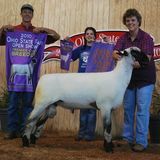 The ewes in the starter flock will consist of aged ewes, yearling ewe, and ewe lamb. If you come to the farm to pick up the sheep, you may select from a choice group of yearling ewes and ewe lambs, or we can select for you. Due to the uncertainty of knowing which aged ewes will be available, you may or may not be able to select each individual for the aged ewes. However we pride ourselves in making sure that all animals that leave our barn and sold to customers are in the best condition possible. WE WILL NOT SELL IF THERE IS A KNOWN HEALTH ISSUE WITH ANY SHEEP ON OUR FARM. ALL OF OUR PROBLEM SHEEP ARE SOLD TO PRODUCERS OR BUTCHER.